Jukka Kaukonen at K&K Superyachts asks me to announce location changes for the three Wally sailing yachts he has exclusively for sale, the 28.55m Kim, 23.99m Bagheera, and 24m Ryokan 2 and I'm happy to oblige. First, Kim was built by Wally Yachts in 2003 to a German Frers design as a fast cruising sloop. This superyacht has been continually upgraded over the years and successfully integrates the performance of a maxi racer with the characteristics of an ocean cruiser, easily and safely sailed in the rough waters of the North Atlantic. Accommodation is for six guests and three crew, while a 250hp Cummins engine delivers a cruising speed under power of 12 knots. Kim is located in Palma de Mallorca asking €5.9 million. 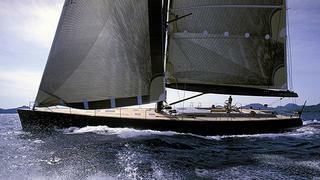 Then there's Bagheera, built in 2009 to a design by Wally and Farr Yacht Design. RINA classed, her ultra-modern interior by Wally and Lazzarini & Pickering accommodates up to eight guests in a master suite plus two twin staterooms and two Pullman berths. A single 190hp Yanmar engine gives this superyacht a cruising speed of 10 knots under power. Now lying in Monaco, Bagheera is asking €5.5 million. Finally, Ryokan 2 is a Wally 80 cruiser/racer. She was designed by Farr Yacht Design and built by Wally in 2006. This canting keel version of Wally 80 was originally called Shaka and later known as Highland Fling when she underwent serious IRC optimizing with a new high aspect ratio rudder and new deeper canard which was completely re-positioned as well. Her current owners have made further improvements by lowering the boom and rebuilding the hydraulic system that operates the winches and Magic Trim System which is used for sheeting the main and self tacking headsails. The interiors of Ryokan 2 are by Lazzarini & Pickering with leather detailing throughout the three guest cabins, all with en-suite bathrooms. Ryokan 2 is available to view in Cannes asking €3.25 million.